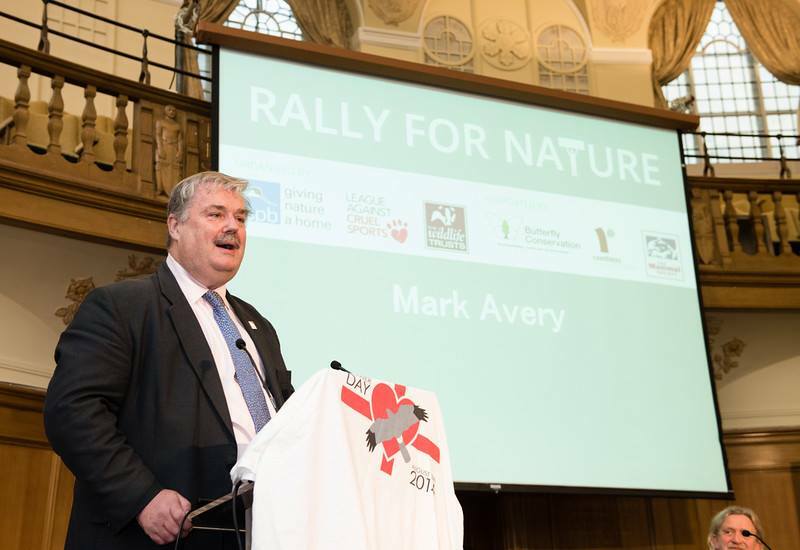 Earlier this week I went along to the second sitting of the Rally For Nature in London, an idea of Mark Avery taken up by the RSPB, League Against Cruel Sports and The Wildlife Trusts. If you’re following the plight of the natural world you probably already know that the State of Nature report published last year found 60% of species in the UK to be in decline, and that in 2013 in England no hen harrier chicks were raised at all as a result of intense persecution of raptors & terrestrial carnivores on grouse moors. You may also know that the natural world provides many physical & mental health benefits, and that a lack of it is linked to health inequalities in our society as shown by a report from this year – very important, since an estimated 1 in 4 of us suffer from mental health issues at some stage during our lives (myself included), thus ‘ecotherapy’ may do a lot for relieving the strain on the NHS. For all these reasons and more, I sat amongst strangers and old friends alike whilst Martin Harper, director of conservation for the RSPB, spoke about the proposed weakening of the EU Directives for Birds & Habitats, cornerstones of UK wildlife protection in the UK, and we could contribute to their defense. Stephen Trotter, of The Wildlife Trusts, spoke about the Nature & Wellbeing Act, an Act to reconnect society with nature for our own sakes and bring about both the recovery of nature & a reversal of habitat fragmentation. Finally, the League Against Cruel Sports CEO Joe Duckworth spoke out against wildlife crime for which the vanishing hen harrier has become an icon. MPs from the Labour, Liberal Democrat, Green & Conservative parties also offered words of encouragement throughout the day, but no word from UKIP, presumably because their party members were hatching another plan to farm elephants. With all these briefings explained, everybody (including Bob the campaigning red squirrel, a fox and a badger) marched to Westminster and in to the St Stephen’s entrance to the House of Commons to ask for an audience with their representative MP; during this walk I kept trying to sneak into photos with the organisation heads, succeeding once, which I believe is called ‘photobombing’. I appear on Mark Avery’s blog, in the sixth photo down, result! 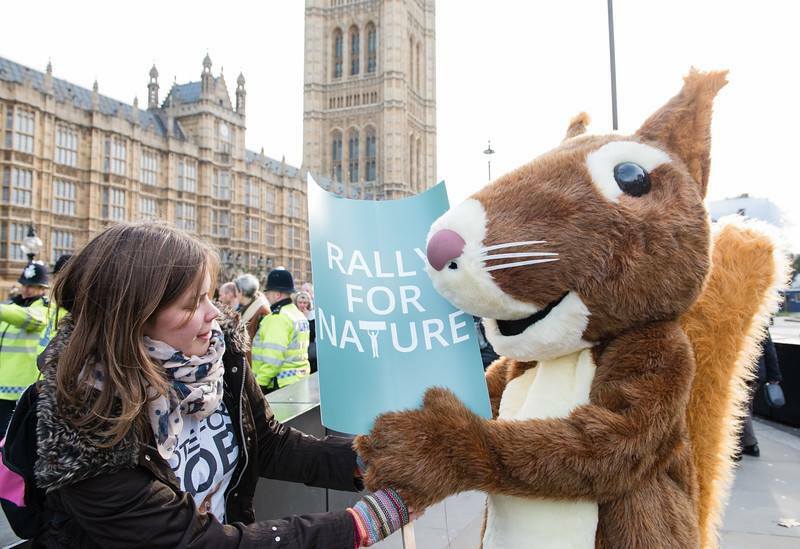 Disappointingly, my MP was absent from the House of Commons on the day, but I did see the impact that others were making when asking their MPs to defend the natural world, and it did indeed seem to be an effective way of campaigning for change. I’m feeling empowered by the process and I have arranged to meet my MP on the 9th of January. I’ll only have 15 minutes, but this should be enough time to outline the Nature & Wellbeing Act and its benefits to people, as well as the problem of rising wildlife crime – not just for hen harriers, though two of those that I protected this year have already been lost (likely destroyed), but also for increasing illegal badger persecution. The Badger Trust’s 2013 report on badger incidents shows that in 2012 there were 353 incidents, but 657 in 2013, 151 of which were badger baiting. An invite for a walk in the woods where I regularly film wildlife might be an idea, to explain why the priority species that live there need habitat connectivity. After the meeting I’ll post an update about whether he is supportive of these environmental efforts. 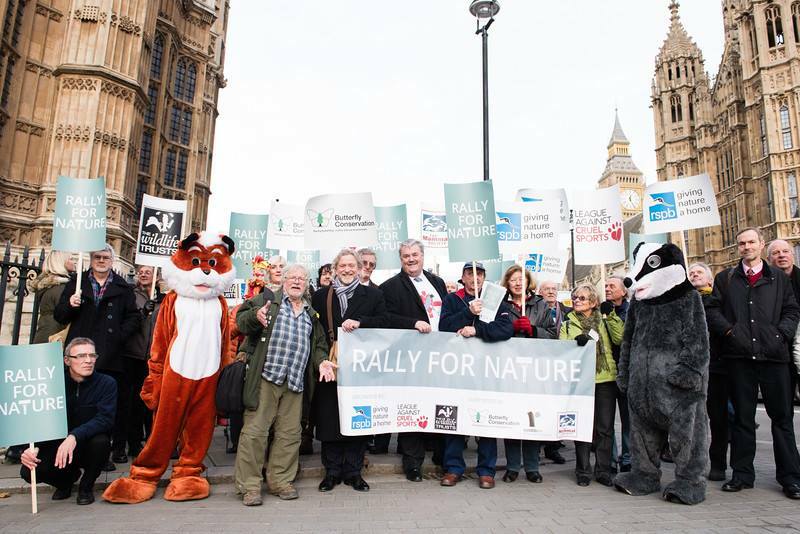 In the mean time, why not get involved and arrange a meeting with your own MP to stand up for wildlife and our natural heritage? They work for you, after all. Photos courtesy of Mark Avery, from his blog post on the event. An Arctic Affair…That’s what the brochure called our adventure, which was in reality a two week cruise up Norway to Svalbard, an island group where-in lies the most northerly settlement in the world, less of an affair than a breath-taking foray to the top of the world. Dilemma number one, what to pack? 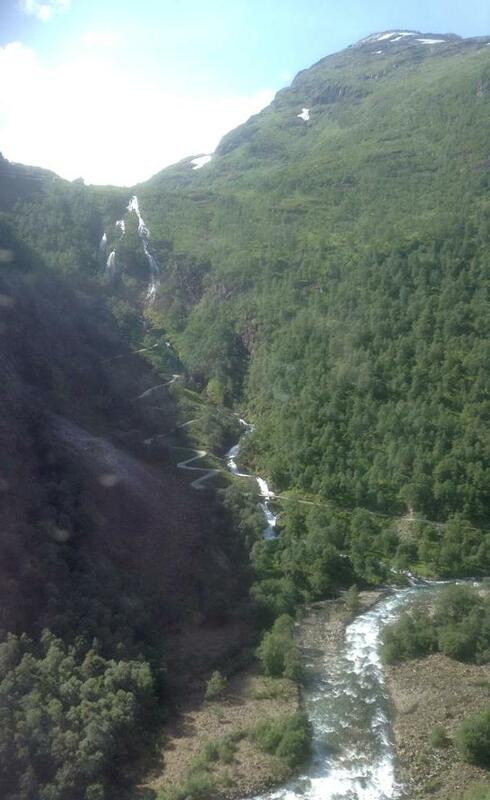 It’s July, going to be warm in southern Norway but Svalbard, approx. 600 miles from the North Pole, might be somewhat chillier. Luggage limit 23kgs each, it was difficult, but we managed it, packing everything from swimsuits to jumpers, beach wraps to waterproofs and flip flops to hiking boots. We boarded in Newcastle, headed straight for the bar and immediately relaxed. 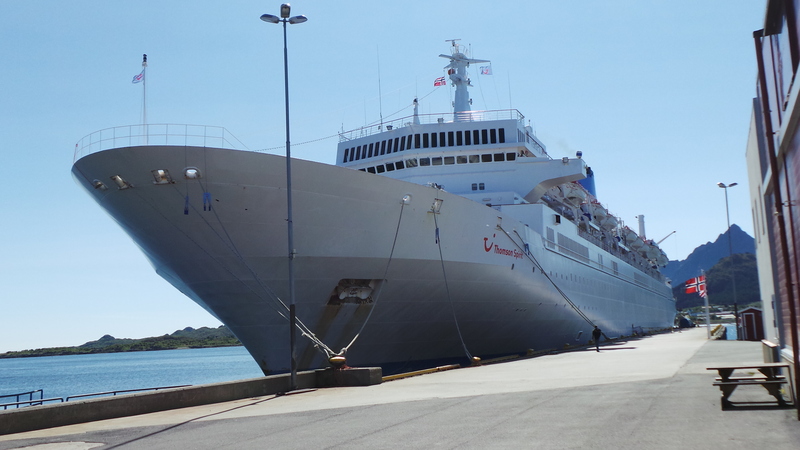 We had been on this ship, the Thompson Spirit, last year and so didn’t need to do the obligatory orientation walk. The rest of that day was the sail away, dinner, and unpacking, drinking and general merriment. I have to say, the major joy of a cruise is in not having to pack and unpack every time you go somewhere new, your hotel room goes with you to all your destinations! We had nine stops ahead of us on this trip but a day at sea first to get properly into the holiday mood. Having the all-inclusive drinks package was going to be a major factor in this endeavour. The first stop was a quick drop off for trippers in Hellesylt but we stayed on board for the sail through the Fjords to collect the trippers from Geiranger. 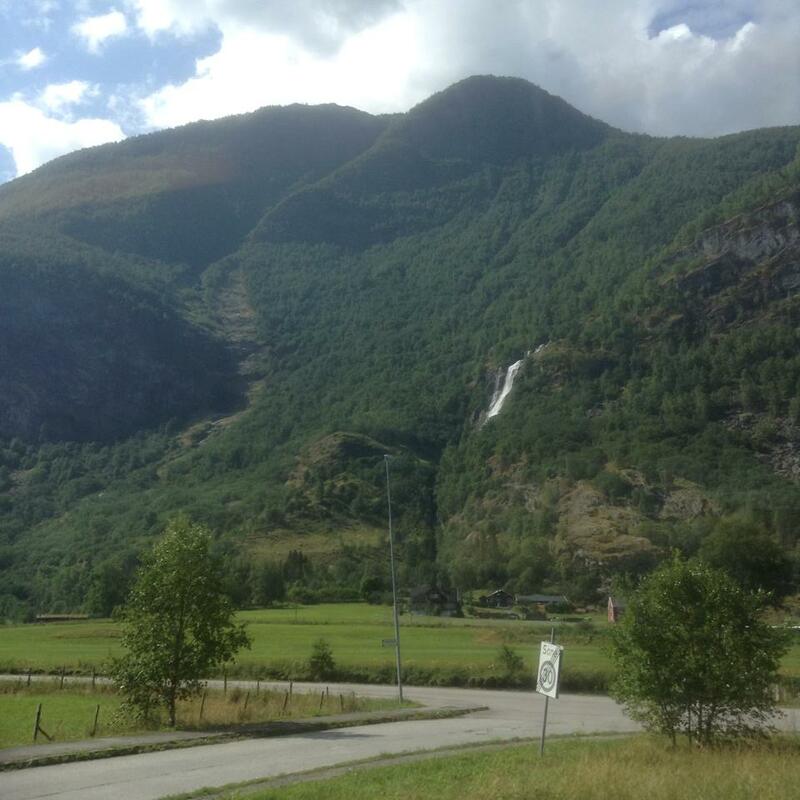 Not only did we pass through magnificent scenery, on a glorious summer day, but we passed the Seven Sisters waterfall, fairly sedate in July but must be a sight to behold in spring when the melting snow is rushing down the mountain sides. 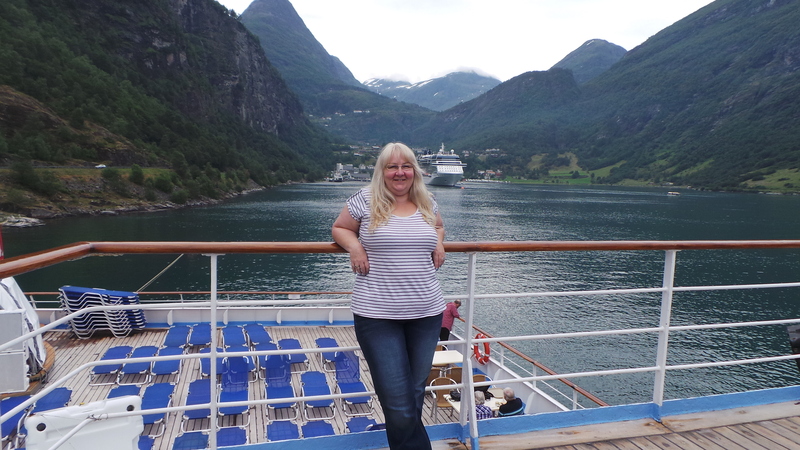 Sailing back out of the fjords on our way to our next port of call we took in yet more glorious views, all accompanied by classical music belting from the ships speakers, a truly magical experience. And then we crossed into the Arctic Circle. 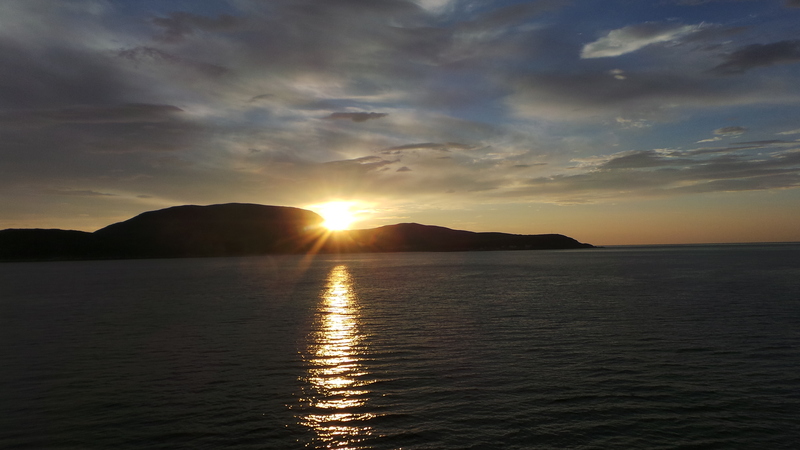 More eating, drinking, shows, quizzes, meeting new people and general fun stuff that evening (and every evening) but that evening we had our first, and forever memorable experience, of the land of the midnight sun. We came out onto the deck at 1am in the morning to such an incredible sight, colours I’d never seen before, shimmering silvers, pinks and blues, lit by the sun hovering just above the horizon. It was simply magical, like being on the road to heaven. We just didn’t want to go to bed and miss any of this but we had more nights ahead. Our next stop was in Tromso, known as the ‘Gateway to the Arctic’. A large city which has seen the start of many polar expeditions, including that of Roald Amundsen, Norway’s most famous arctic adventurer. We took the tour going to the Northern Lights science museum, as you don’t see the real thing when the sun doesn’t go down. The film was shown in the planetarium, where you recline and watch it on the domed ceiling, and as it had all been filmed in and around Tromso we got a great idea of how phenomenal the Northern Lights are. Note to self, book a trip to Iceland in January! 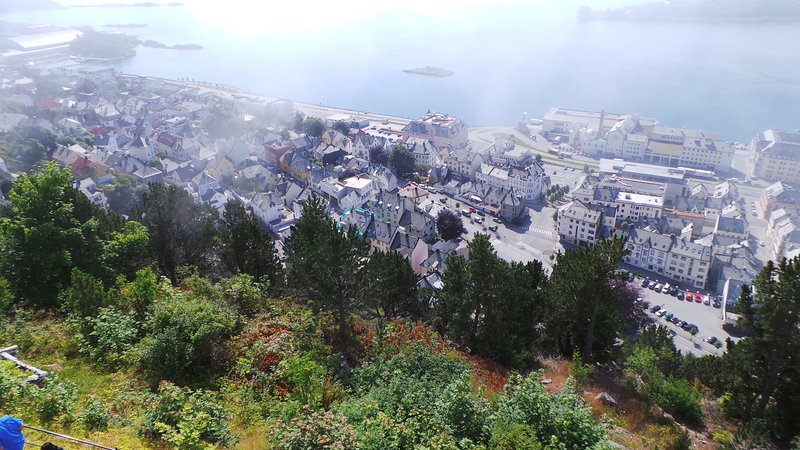 The trip also did a bit of a scenic half hour around the city, the most notable view being the sight of a reindeer walking along the pavement, they run free here apparently. We had also seen whales swimming along by the side of the ship but the pesky buggers were not happy to be photographed, hence this blurred zoomed in effort that was the best I could get. Over the next couple of days we were at sea and made a last mainland Norway stop at Honningsvag, the home of the Northern Cape. 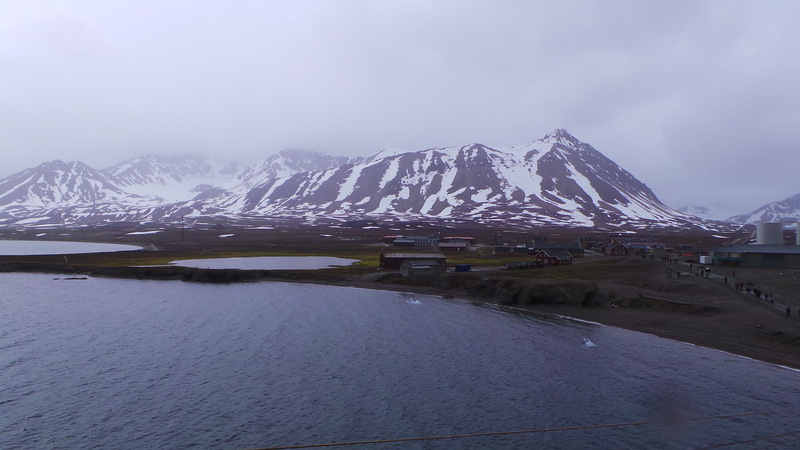 More amazing scenery, still in delightfully warm summer weather, but we were anxious to get to the main event, Svalbard and the northernmost settlement in the world, Ny-Alesund. We arrived on Sunday morning, the drop in temperature from mid-twenties to six degrees most notable. This is a bleak and barren place, snow on the mountains even in July and this settlement, with only 30 permanent residents, is in darkness for the best part of eight months of the year. Ny-Alesund is in effect a hodgepodge of outbuildings, used for scientific research on global warming, arctic flora and fauna and other geographic sciency stuff. We had a walk around the settlement, phones had to be turned off, stick to the paths, don’t talk to polar bears, that sort of thing. 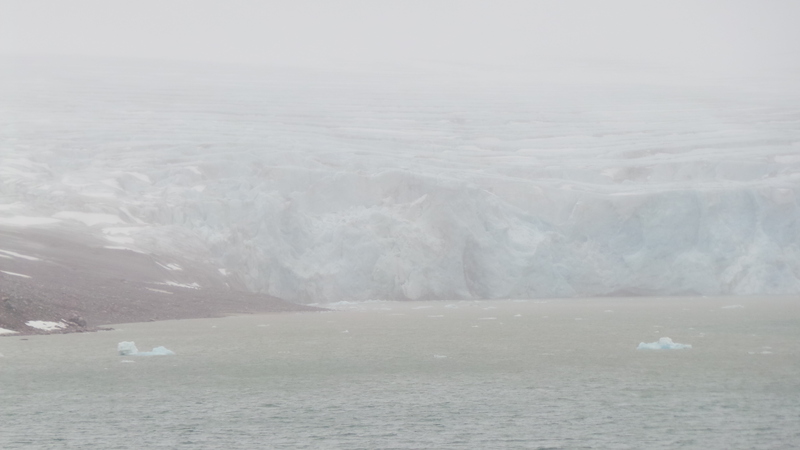 We didn’t actually see any polar bears but on Svalbard they significantly outnumber people. 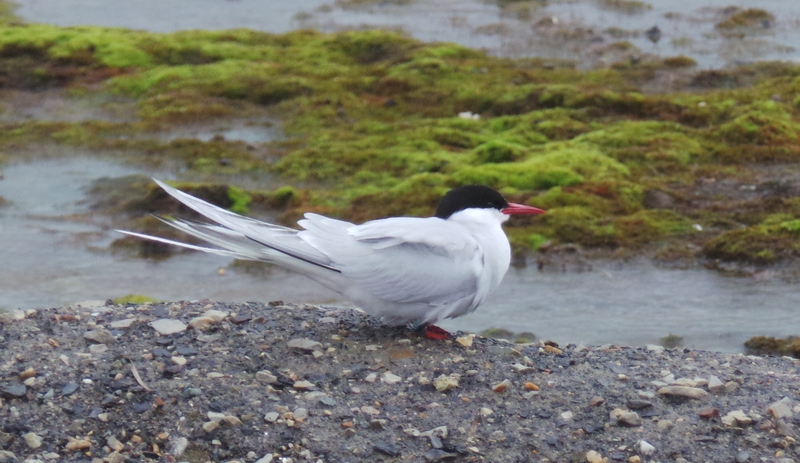 I did get dive bombed by an Arctic Tern when I got too close to her nest, we got soaked in the driving sleet but by golly it was a wonderful day. 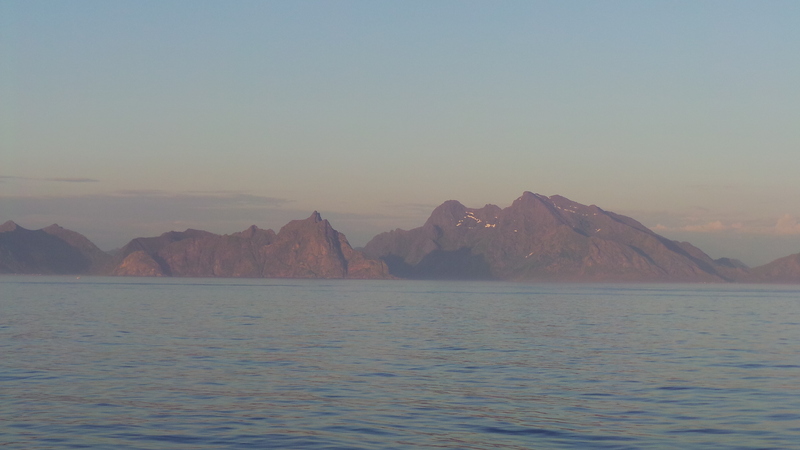 The sail from Ny-Alesund took us into the Magdelena Fjord that evening. 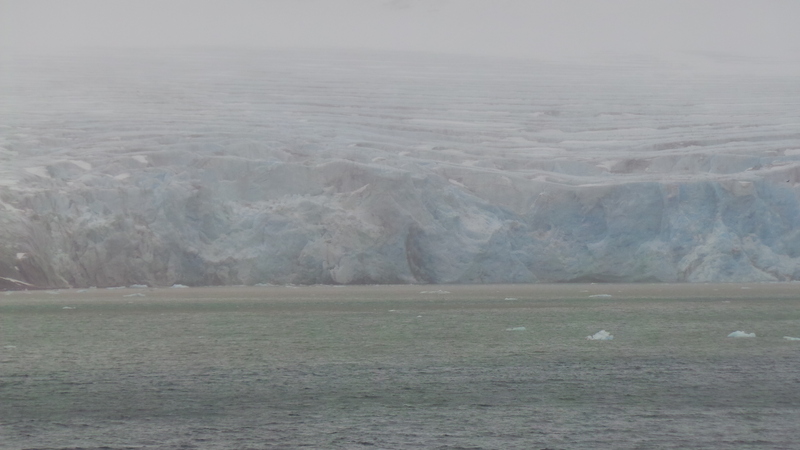 This is simply stunning, even in fog and damp weather the sight of the glaciers climbing over and down the mountains was amazing. These monsters were hundreds of feet high and had been moving through the land for millions of years. It’s hard to take in the magnitude of this wonder of nature and even harder to get a picture that truly puts them into perspective. Next day found us in Longyearbyen, the largest town on Svalbard and home to the Svalbard museum and Camp Barentz. We joined the tour, there aren’t any taxi’s here so going it alone which we normally do wasn’t possible. First stop Camp Barentz, a tourist spot in the middle of nowhere which has a replica of an explorers hut, a wigwam type structure (where we found caramel cheese waffles – delicious) and most importantly, a husky farm. I was in my element. These are real working dogs but they are so used to humans, and are handled from very early that they get very excited when we arrive. These aren’t the fluffy domesticated husky back home, these are dirty, moulting and live in wooden boxes but they were so friendly and lovable. 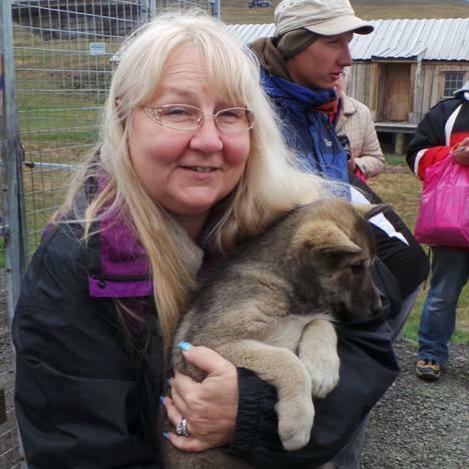 I even got to hold a puppy – fantastic. We then went to the museum, which houses various stuffed examples of the wildlife and a bit of history about all the polar expeditions that have gone from the island. Another day at sea, chilly but bright before stops in Bronnysund and Leknes, where I stayed on the ship sunbathing because honestly there’s only so many Norwegian towns you can visit before you realise they are pretty much all the same! Our penultimate stop was in Alysund, interesting because the whole place burnt down in 1904 and was rebuilt art deco style in just six years. We took the local mini train up into the mountains to see the town from above, it’s very Disney medieval village styly from up the top but great views. 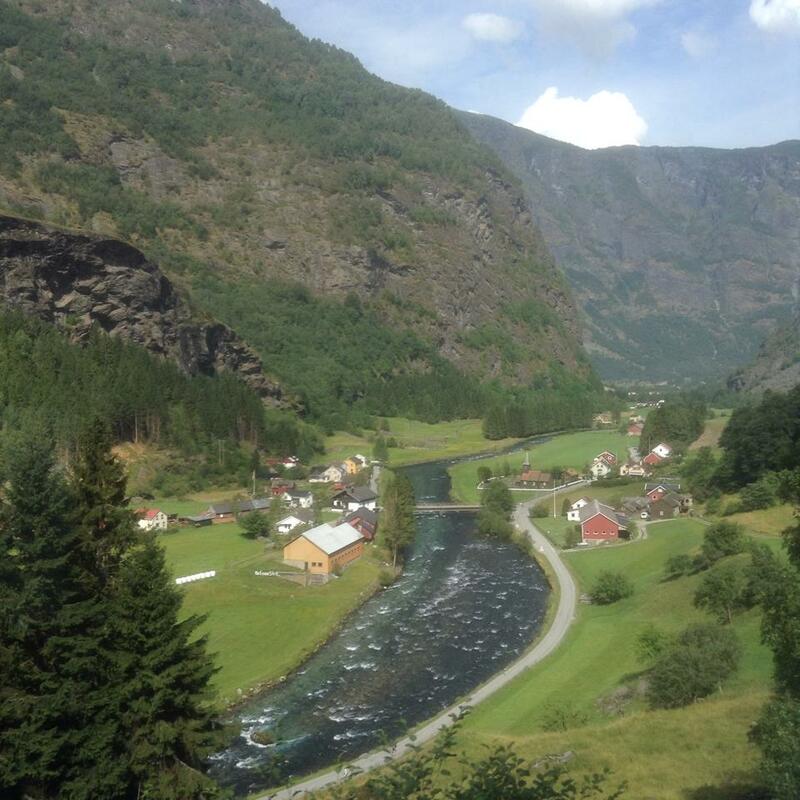 Our last port of call was the truly stunning Flam, a town which sits at the end of a Fjord and from which you can get a train up through the mountains (which obviously was what we did). There are a load of wonderful pictures from that train journey, here are a few . . .
And then it was home again, so I will leave you with a final sunset and a recommendation to get there if you can because the sights and experiences of this trip will stay with you for a lifetime. I never intended to become a wildlife campaigner but I think I have to admit to myself that is what I am today, at least in part, even if I’m not that good at it – since January I’ve been doing my small part for the wider campaign for hedgehogs, called Hedgehog Street, and part of this is a national survey running from the 1st of February to the 31st of August, and this has been ongoing for three years (see the reports for 2012 & 2013 here) to form a better picture about what is happening to them. To support this I’ve promoted the campaign in a few local media outlets such as Nantwich News & The Cat Radio to ask people to get in touch with sightings; but the most enjoyable part of this is the glimpses of this mammal that I’ve had myself; though it was before I knew of the survey the most memorable (and odd) encounter was last summer when an adult woke me up in my garden by running into my face. When we both got over the shock it ran off, and I was surprised at how noisy they can be for their size (something hedgehog lovers have long known of course, but I’m new to the table). My later realisation was not quite as amusing and markedly less joyful; that these animals, beloved by almost everyone in the country (I’m going to exclude gamekeepers because of their use of the indiscriminate fen trap), have been severely reduced in numbers by our activities since the 1950s. Whilst the precise numbers are unknown, it’s very unlikely that there are more than a million left, a fraction of their numbers in the 1950s. The threats to the hedgehog are too numerous to mention but an overview can be found here with suggestions about what you can do to help them; and please do so (but not with milk! ), because it may not be long before the many ‘I barely see them anymore’ equivalents I hear when discussing hedgehogs with people start becoming ‘I never see them anymore’. You can register to help with the national campaign here. On to the moomins! You may have heard that beavers have been on the River Otter in Devon for a few years, likely having escaped from captivity nearby. Historically, the European beaver lived throughout the UK but was hunted to extinction for its fur & meat. Fortunately, the beaver is an ecological keystone, as George Monbiot explains, meaning it is a real gem for the river ecosystem, and so the results of its presence wherever it is reintroduced in Europe are very positive. Unfortunately, the knee-jerk response of the Department for Environment, Food & Rural Affairs (DEFRA), an already infamous government department due to their policy of culling badgers, is to capture these individual beavers and place them in zoos for reasons that soon fall apart under the mildest of scrutiny; that they harm fish populations, when in fact the presence of beaver dams is a great boon for fish as shelter and breeding grounds. Species of high conservation priority also benefit from the dams such as otters & water voles. One renowned ecologist finds this plan to effectively eradicate the beaver from the English wilderness a second time so abhorrent that he is threatening legal action if DEFRA proceed with their plan. I have sent DEFRA my own comments with a request for them to re-consider; I hope you’ll do the same. Onwards & upwards for our mammalian neighbours!